Let me start off by saying, I never thought I would be able to crochet (let alone design) something to add to my wardrobe. 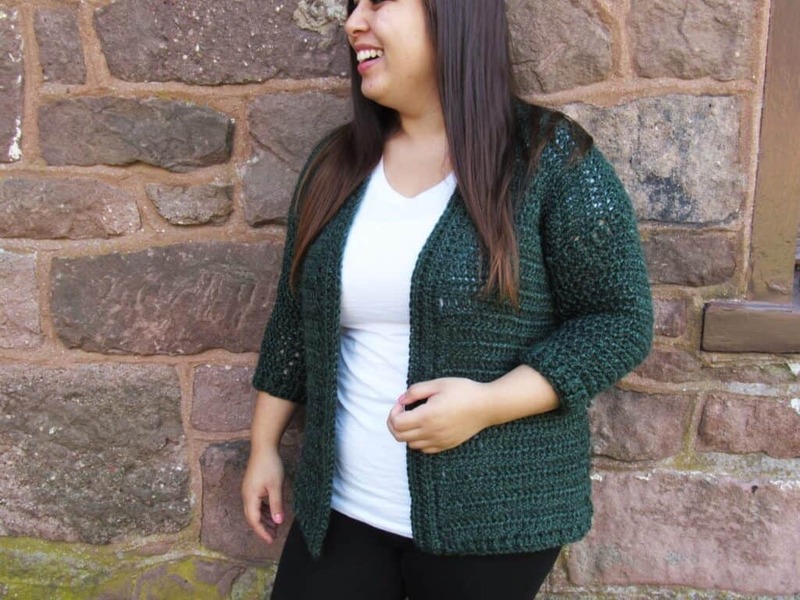 Now that I’ve made and designed my first ever cardigan – I’m already working on the next one! 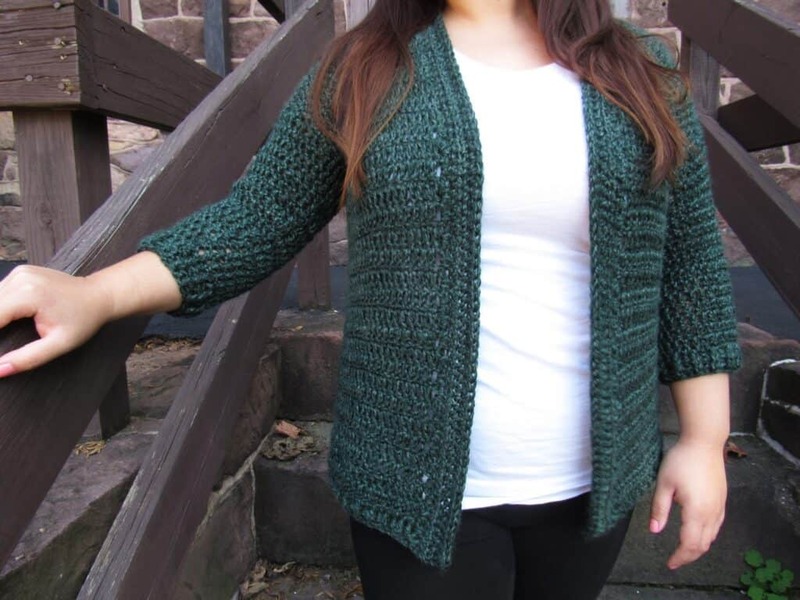 Once I figured out the basic construction and sizing of a cardigan, it was pretty smooth sailing from there. My first attempt at a cardigan was awful and my biggest mistake was not leaving a few extra inches to my measurements. This made things just a bit skin tight and discouraging as I couldn’t figure out why my measurements were ‘wrong’. At that point, I back tracked to a more simple style of top – a shrug. It was basically making a rectangle and sewing up the sides leaving some holes for arms. You can find that free pattern here. Once I did more research and realized what I was doing wrong with the measurements, I did more research about some construction so I would surely get it right this time. Armed with knowledge, I dived into designing. I knew I wanted something simple yet detailed. Just enough detail to make it seem like my wardrobe is pulled together (and it’s totally not – T-shirts and leggings are my jam). So it’s safe to say, if I need to look a little pulled together – this is going to be my cardigan of choice to do so. I flipped through one of my stitch dictionaries to see what I could use to spruce up a basic cardigan. 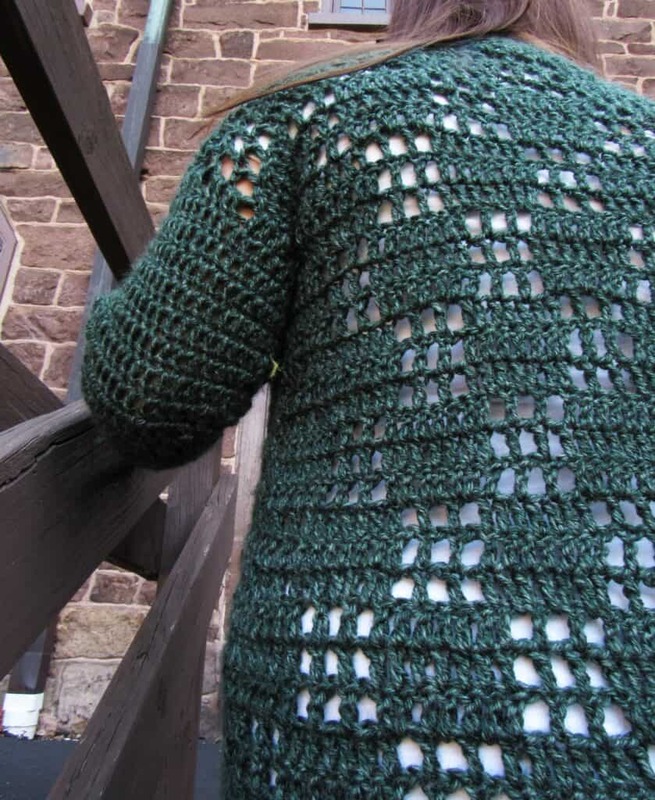 When I saw this checkered filet look I knew it would make the perfect back panel for this cardigan. I think it adds just enough detail and it’s really easy to do! Just double crochets and chains. The front panels and sleeves are just as easy. 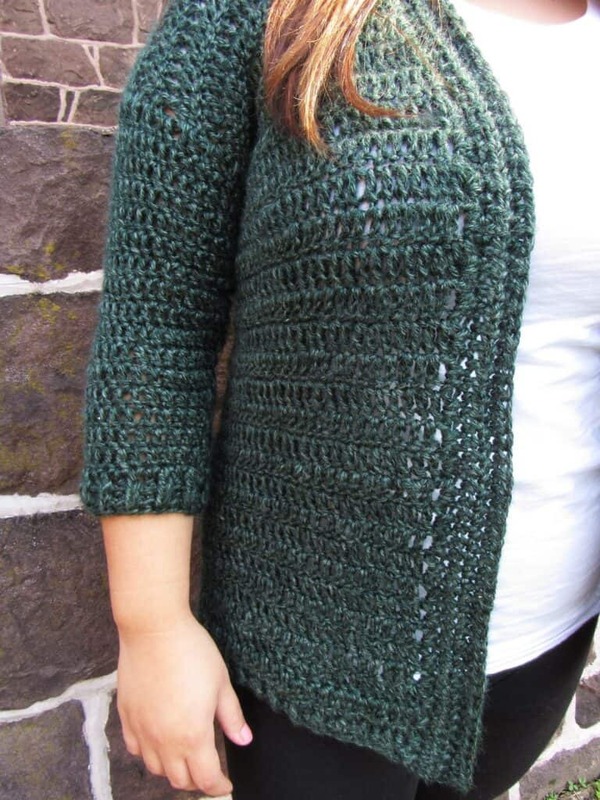 Just double crochets – plus some increases and decreases here and there for a tapered look on the top front and for fitted sleeves. And let’s talk about those sleeves. Anyone else a fan of 3/4 sleeves? With my long sleeve tops and sweaters, I’m constantly pulling the sleeves up to do dishes, pull clothes out of the laundry, assisting with the potty, cleaning up unknown substances off the floor, you know – the usual mom stuff. With the 3/4 sleeves I can do all of those mom things comfortably without sleeves getting in the way. 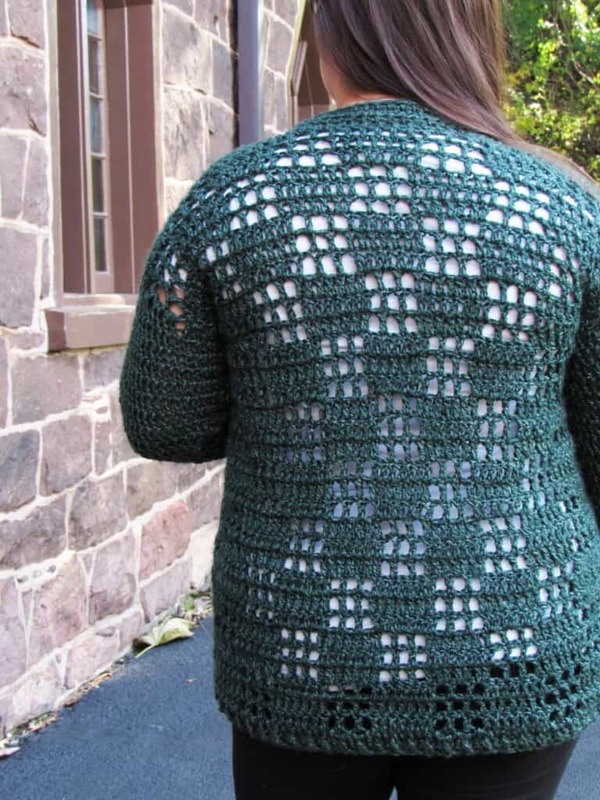 If you prefer long sleeves, don’t worry – there are instructions in the pattern to do so! 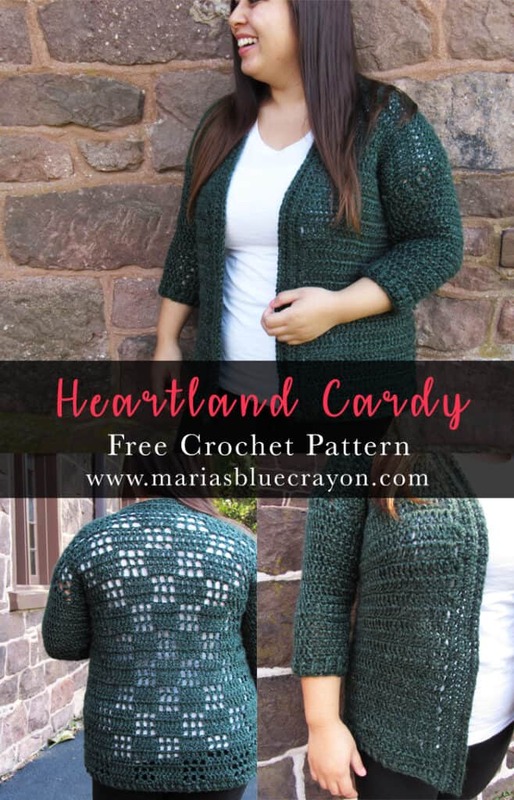 Before beginning this cardigan, please read over the general construction notes as well as the pattern notes! Sizes Large and XLarge will be found on a separate post at the link at the very bottom of this post. Save it to your Ravelry for safe keeping, or pin it to your Pinterest boards! You can also purchase the ad-free downloadable to print on Ravelry. I think the sizes run small, if you are on the fence about what size to pick or would rather a bit more of a loose fit – go a size up. The cardigan will start with making the back panel and continuing onto the back panel to make the first front panel. Yarn will be attached as indicated in pattern for the second panel. Once back panel and front panels are made, the front panels will be folded down onto the back panel. Using the whip stitch, the front panel will be seamed together with the back panel leaving holes for sleeves. Sleeves will be made around the holes left from seaming up the sides. Edging will be completed last around the panels and then on the bottom. Attach yarn 12 spaces away from the first panel. You will have 11 stitches between the panels. Sew front panels to back panel together by whip stitching up the sides. Leave 10 rows for arm holes. 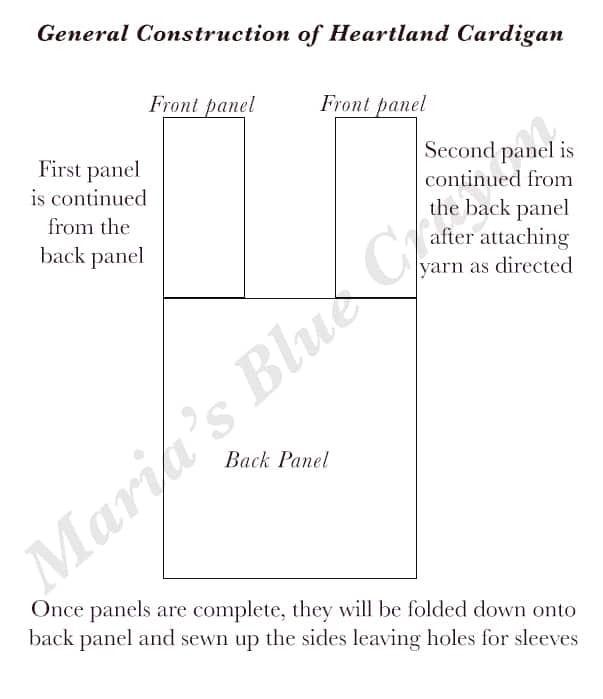 Attach yarn 12 spaces to the right of first panel. You will have 11 stitches between both panels. Looks really nice. Thanks for the pattern and your hard work! Sorry for the confusion! I must have made some sort of typo there. For row 4, we are working double crochets over the filet 'holes' and the filet 'holes' over the double crochets. So starting Row 4, you will chain 4 (and that counts as the first stitch and ch 1), skip one stitch and then DC into the next. That will make a filet 'hole'. I think maybe I meant to say skipping one space. Sorry again for the confusion, let me know if I can clarify any further!! Hello 🙂 I am currently working on this awesome cardigan, but I do have one concern can you provide a measurement for the back panel? Ive been following the pattern for the medium size and it looks very small . :) thanks!